Stephen Howard Daniels, a lifelong journalist, died at his home in Olympia on June 9, 2011. 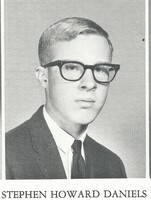 He was born in 1947 in Painesville, Ohio. Since 1993, he worked as a freelance writer with a primary commitment to the McGraw-Hill construction group, covering major construction projects in the Pacific Northwest. He wrote cover stories for Engineering News-Record about the building of Safeco Field, Paul Allens Experience Music Project, Portlands Rose Garden and wrote about hundreds of other major engineering feats for Architectural Record, World Architecture and other publications. A graduate of Miami University, in Oxford, Ohio, he began his career as a sports reporter at the former Painesville Telegraph. He worked for the Willoughby News Herald, the Hamilton (Ohio) Journal and The Daily Times in Woodbury, N.J. before moving to Arizona, where he spent 15 years with The Arizona Republic. At the Republic, he covered the Colorado River region from Kingman, Ariz. for the nations ninth largest daily newspaper. He took readers on a snipe hunt for the Yuma Clapper Rail, led a team investigation of covert wrangling for the Western water and wrote extensively about environmental issues. His willingness to confront tough environmental issues, coupled with high quality and accurate presentations have significantly aided public recognition and support for resource management, said Sam Spiller, Field Supervisor for the U.S. Department of Interior Fish and Wildlife Service. He had major influence on both land management and public perception, Spiller said. Daniels won New Jersey press Association awards for page design, sports writing awards from the Ohio Press Association, and was twice a finalist for the Jesse H. Neal Award by the Construction Writers of America. His exposure of the issue of nuclear deregulation was the subject of a story by the Columbia Review of Journalism, and his work for Engineering News-Record was cited in 2006 in the book Journalism that Matters, by Robert Freedman and Steven Roll. An avid skier, he moved to the Northwest in 1987 and worked, for a time for the Idaho Mountain Express is Sun Valley, Idaho. He left the paper to work on a book. A November Sky was a probe of the 1987 crash of a Continental Airlines DC-9 at Denvers Stapleton International Airport, an incident that exposed the perils of the airline deregulation and opened the door to a new era of aviation litigation. His passion was baseball, and he played slow-pitch softball at a high level until his death. His goal, late in life, was to continue to hit .500 points better than Jeff Cirillo. In 1984, Daniels was named to the American Softball Association All-American team. He also played tennis, and for several years held both singles and doubles titles at PacWest in Olympia and at the Valley Athletic Club in Tumwater. He won numerous local tournaments, and in 1998 was the Lacey Mens B doubles champion. He was a longtime member of the U.S. Tennis Association and the American Contract Bridge League. He is survived by three children, Gordan and Michael of Sarasota, Fla, and Gretchen, a civil engineer in Houston Texas; a brother, John, of Olympia, and his father, John, of Painesville, Ohio. What an amazing life and legacy! And,to think we knew him when. I can still picture his smile and that sense of humor for the ironic. Steve gave all of us do much to admire. Rest in peace buddy. We miss you.